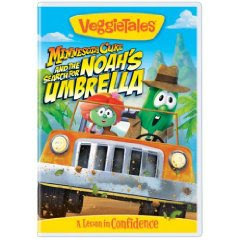 Our family has always loved Veggie Tales so I was very excited when the Family Review Network gave us the chance to review Minnesota Cuke and the Search for Noah's Umbrella. From KIDS FIRST! 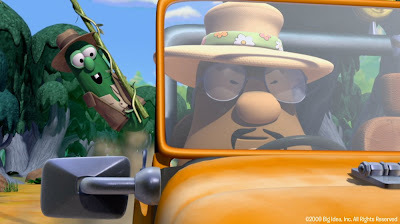 : Self-affirming and moral lessons are fun to learn when smoothly integrated into an Indiana Jones-like plot with songs, humor, and talking vegetables. 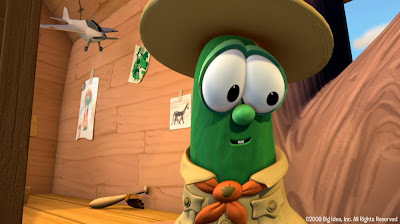 VeggieTales skillfully uses stories from the Bible to provide useful lessons for children. 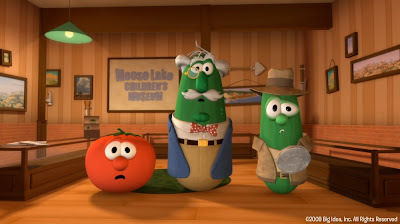 In this episode, Minnesota Cuke feels constantly ashamed when others laugh at him for doing the right thing, but in his quest to find his friend he learns that his role model—Noah—had similar issues. Utilizing "Indiana Jones and the Last Crusade" as the narrative model, the band of Veggies must follow clues given in an instruction manual to wade through the trials and find Noah’s mysterious relic, his umbrella. A cast of friendly vegetables that children can relate to serves a double purpose of conveying an educational story, as well as familiarizing children with vegetables (so that perhaps at the dinner table children can be encouraged to eat them instead of be afraid of them). This is a film with a clear message and an entertaining story for kids, and cinematic references for adults to enjoy. 50 min. ; Ages 5-8. I have always appreciated how family-friendly Veggie Tales are. I never have to worry about inappropriate content. The life lesson from God's word is perfect for kids. 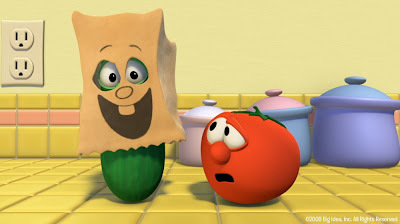 Veggie Tales has a ton of wonderful family friendly entertainment- give it a try!! This post was written for Family Review Network as part of a program for Big Idea, who supplied the DVD for review."